The geometry resolution generated by DynaMesh is limited to a cube of 2048×2048 (about 4 million polygons per cube face and approximately 24 million polygons per DynaMesh/Subtool). Remember this is a maximum – DynaMesh is intended as a concept tool and works best at lower resolutions – working with many millions of polygons will slow down your computer. However, also bear in mind that when the mesh bounding box is pushed out of this maximum resolution, the geometry can start lose details. When you start with a low resolution, a larger model will be allowed before it starts losing details. A higher resolution will allow more small details, but it will be limited in terms of how much you can expand the bounding box size – in other words, how far you can push the surface between remesh operations. Defines the resolution of the DynaMesh, controlling the overall polygon density of the model. 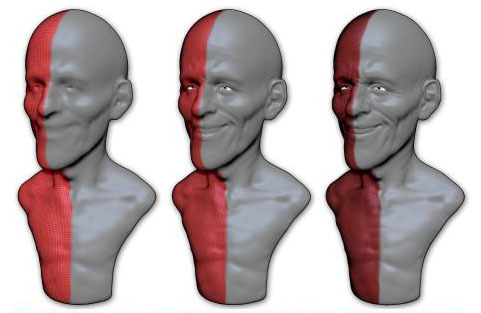 A low value will create a low resolution mesh with a low polygon count, while using a higher value will create a high resolution mesh that will retain more details at the cost of a higher polygon count. A low resolution DynaMesh will update faster while a high resolution one will take more time to update. As long as the DynaMesh remains in a 1024x1024x1024 resolution cube all details will be maintained as you remesh. If your sculpting causes the DynaMesh to exceed a 1024x1024x1024 space, the mesh will be updated to once again fit with the cube. At this point it could begin losing details. When enabled, any DynaMesh with multiple PolyGroups will be split into separate pieces. It will still be kept as one SubTool. When enabled, the current details of the model will be projected onto the DynaMesh automatically. This can be useful when converting a polymesh with existing details to a DynaMesh. Remember that the Resolution setting will play a big part in the amount of detail that can be retained. Applies a smoothing effect to the DynaMesh when Project is enabled. A low value generates a small amount of smoothness while a high value will smooth all major details on the model. When enabled, this option applies the various ClayPolish settings each time you update the DynaMesh. This is meant to smooth sharp corners. Defines the thickness of the shell in relation to the resolution of the DynaMesh. TransPose can be highly useful when working with DynaMesh. See the TransPose section of this documentation to learn about actions such as duplicating an inserted mesh (both positive and negative) and working with masks.